Monitor Engineer Jamie Hickey is using DPA microphones on drums and vocals for all the band’s live concerts and TV promos. ‘Awesome’, ‘clean’ and ‘transparent’ are just some of the superlatives monitor engineer Jamie Hickey uses when describing the effect DPA microphones is having on Snow Patrol’s live drum sound. Hickey, who began working with the Irish band in January, says using DPA’s d:dicate™ 2011C Compact Cardioid Microphone is ‘a bit like plugging your own ear into the mixing desk’. On a snare drum, for example, there’s no proximity effect – you don’t need to boost the highs or dip the mids to make it sit in the mix. The d:dicate 2011C is completely transparent and the transients are so clean and quick that there is no hint of distortion. 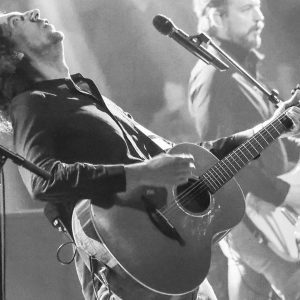 Snow Patrol’s first tour in seven years began in smaller venues in Ireland and Northern Ireland and is now taking in the summer festival circuit in the UK and Europe. “We’ve also done a couple of TV promos in the USA (The Late Show and The Late Late Show) and some underplay shows in London, New York and Los Angeles,” Hickey says. “I’ve been using DPA microphones for years – firstly the d:screet™ 4061 miniature microphone, which I originally tried out on strings with Tindersticks in 2008, and subsequently the d:vote™ 4099 Instrument Microphone, which I am now completely hooked on,” Hickey says. “After Tindersticks, I went on tour with David Gray and we started using the d:facto Vocal Microphone on his vocals. That tour quickly ended up with DPAs everywhere – d:vote 4099s on toms and cello, d:dicate 2011Cs on snares, d:dicate 4011s as overheads and 4023 Compact Cardioid Microphones on piano – the list goes on and on. Hickey adds that, from a monitoring point of view, the d:facto Vocal Microphone makes life much easier thanks to its natural frequency response and excellent attenuation of off-axis sound sources. Having a good relationship with DPA’s UK subsidiary Sound Network is something Hickey values, mainly because there is always help on hand if he needs equipment at short notice.